Kersi Lord welcomes you to his website. Mr. Lord is the son of Dadasaheb Phalke Award winner Cawas Lord. This website is dedicated to music and music lovers alike. Friends and fans, feel free to get in touch. Caught the first day first show of 'Jail' yesterday. I found it a very well made film with an interesting background score that had a wonderful seventies-eighties feel to it. Well done Amar (Amar Mohile)! It was nice to hear Lataji's voice in the film after a long time. The song was very appropriately used. I'm also happy that my friend's grandson Neil has made it in this extremely competitive industry. He and Manoj Bajpai are two outstanding actors and they have done a fantastic job in the movie. My hat's off to the Director, Madhur Bhandarkar. As usual he has created a new chapter in movie history. I've always been a big fan. Kudos to the entire crew, both on and behind the screen. This is one of the TV Shows i enjoyed. 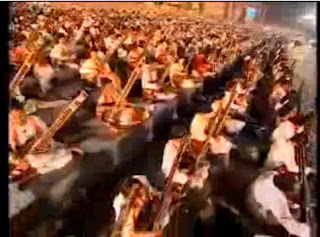 A thousand Sitarists & other musicians played on one platform for the first time in the world, in the Brahm Naad concert for world peace. This image is for representational purposes only. Copyrights are retained by the original owners. If you missed this, click on the links below to view the three full videos. "100% achievement is not the final goal. Even 200% is achievable if you put your mind to it." For proof go and see 'This is it' A tribute to Michael Jackson. Friends! I just saw 'This is it' this afternoon and for the last fifteen minutes i had tears in my eyes. This is just a small piece about my background written by my daughter, Jasmin Lord. Feel free to leave a comment or question and I'll do my best to get back to you as soon as possible. During this period, Kersi and his brother Buji performed a very difficult piece of Western Classical Music Repertoire along with two famous American pianists - Bartok’s ‘Sonata for Two Pianos and Percussion’. Later, Kersi also performed great classical works, including Carl Orff’s ‘Carmina Burana’ and Beethoven’s ‘Ninth Symphony’ twice, with two different conductors, his previous teachers Dr. Coelwriter and Prof. Bueller. These are just the highlights of his Western Classical Repertoire. Another outstanding achievement of his career was when he composed music for the famous play ‘Tughlaq’ which was directed by Alyque Padamsee; staring Kabir Bedi in the lead role. Alyque wanted the score to consist of mainly percussion instruments. The recording was done on a very tight budget and used three percussionists, Kersi and even Alyque. A review given in the Times of India said - “strange but extremely appropriate music by Kersi Lord”. He was also called ‘Mad’ by his friends and family as his modern and futuristic conception couldn’t be digested by everyone.